As soon as they entered the palace, Vasishta, the Royal Preceptor, announced the date when the Coronation of Rama as the Emperor of Ayodhya would be celebrated, giving details of the auspicious attributes of the day which had persuaded him to choose it for the great event. He invited also all the pundits and priests to take part in the ceremonies that the Vedas had enjoined, to consummate the coronation. They appreciated the decision of Vasishta for, they said "a coronation so celebrated would confer peace and prosperity on all mankind." Vasishta called Sumanthra into his presence and addressed him thus, "Assemble the armed forces - cavalry, elephantry, chariotry and infantry - at the city, for the Coronation of Rama is to be celebrated". Those words filled Sumanthra with extreme delight; he arranged for the presence of the army with all its components. The elephants, horses, and chariots were decorated grandly for the occasion. They were posted in serried ranks outside the city gate. The horsemen and the foot-soldiers wore colourful uniforms and they stood at attention, ready to march into the city for the festival. Messengers were sent in all directions to gather in time the various auspicious articles necessary for the rituals that formed part of the celebrations. The entire city was agog with joy; citizens vied with each other in decorating their houses and streets. People felt their two eyes were not enough to imbibe the charm of the city. Rama was specially considerate towards the persons who had accompanied him from beyond Ayodhya - Sugriva, Vibhishana, Angada, Nala, Nela and others. He ordered that proper arrangements be made for accommodating them and for looking after their needs. Accordingly, servants from the palace rushed to perfect the arrangements designed for the comfort of the guests. Rama called Bharatha and with his own hands, he combed his hair that had got matted, since he had not paid any attention to it, for years. The three brothers personally poured holy water and attended on Bharatha while he bathed. Then, Rama received the assent of Vasishta to disentangle his own matted hair and had his auspicious bath. 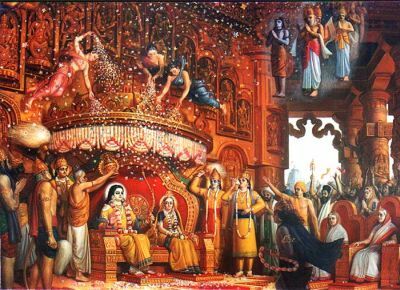 The queen mothers meanwhile had Sita go through her bath also. The mothers carefully combed her matted hair too, and dressed her in yellow silk; they made her wear jewels in plenty. She shone like Goddess Lakshmi. She moved to where Rama was and took her seat to the left of her Lord. The three mothers [Kausalya, Kaikeyi and Sumitra] experienced the highest bliss, looking on, while Rama and Sita were seated together. "Is not this day the luckiest day for us? This day, our lives have achieved fulfillment. This day, our dearest wish has come true. This day, our eyes have had their purpose realized", they said to themselves. They lost all consciousness of their bodies or surroundings, watching Rama and Sita, and taking them to be the God Narayana and the Divine Consort of Narayana, Lakshmi. Vasishta the great Sage was moved by the splendour that shone in the face of Rama. He was delighted beyond measure at the divine effulgence of the Rama Form. 'I achieved today the goal for which I have been waiting so long', he felt, and he ruminated on that joy and remained blissful and silent. He called the servitors and instructed them to bring the Great Throne and install it in the Coronation Hall. It was a throne set with multifarious gemstone which shone like the sun, with dazzling brilliance. Rama prostrated before Vasishta and other sages, and fell at the feet of the queen-mothers. Then, he prostrated before the entire assembly of elders and citizens and ascended the throne, with Sita following him close. The vast gathering rejoiced at the unique sight, so full of majesty and glory. The Rshis, the elders, the leading citizens and the saintly well-wishers were filled with gratefulness and joy. The Brahmins recited appropriate Vedic hymns. The populace shouted Jai Jai, so loud and so often that the sky threatened to fall. It was the seventh day of the dark half of the moon in the month of Vaisakh. Taking the permission of the assembly and the assent of the Brahmins, Vasishta wound round the brow of Rama the insignia of Imperial Authority. Kausalya, the mother of Rama, turned her eyes on Rama every now and then, and felt supremely happy. And, what can be said of the joy of the brothers Lakshmana, Bharatha and Satrughna! It was beyond words. They were holding whisks and the umbrella, and standing behind the throne, as attendants on Rama. In fact, they were all through the years doing penance for the culmination they were enjoying that day! The gods beat drums of victory in the sky; the celestial musicians sang hallelujahs, the celestial dancers danced in joy. Vibhishana, Sugriva, Angada, Hanuman, Jambavan, Nala, Nela, Dadhimukha, Divida, Mainda - these heroes bore bows and arrows, scimitars, spears and stood on both sides of the throne, in reverential humility. With Sita sitting on his left, Rama manifested the beauty of a billion Manmathas (Manmatha - the God of Love) rolled into one. The gods were fascinated by the divine charm of the Lord of the Raghu line. Rama wore silk, interwoven with gold, and he had pendants on his ears brilliant with precious gems. He wore ornaments on his ankles and wrists, which derived beauty from his entrancing charm. The three worlds exulted at the sublimity of the event and the personal grandeur of Rama. Really those who witnessed that scene were the fortunate ones among the living. Vibhishana came forward with a dazzling necklace of gems, which the Lord of the Sea had offered to Ravana. Sita accepted it. Its brilliance shone all over the vast Hall and struck everyone as a unique string of gems. But, with the necklace in her hand, she cast a questioning glance at the face of Rama. Rama knew what was passing in her mind. He said, "Sita! You can grant it as a gift to anyone among those here who deserves your grace." Sita thought just for a second and looked at Hanuman. Becoming aware of the compassion in that look, Hanuman approached her in great humility and stood before Sita with bowed head. The necklace was given by Sita to Hanuman. 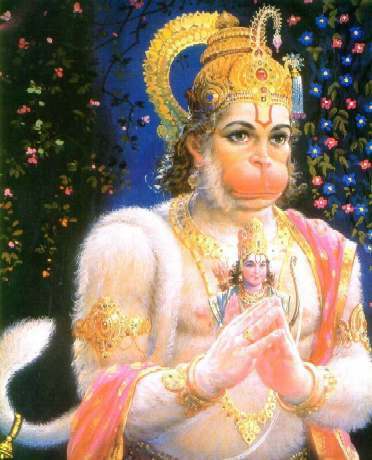 Hanuman turned it around many times in his hand, its dazzle enrapturing everyone in that vast assembly. He was struggling to discover its specialness, with unslaked curiosity. He plucked every gem, put it between his teeth, and placed it adjacent to his ear, and with a face indicating disappointment, he threw the gem away in disgust! All eyes were watching with increasing amazement this peculiar behaviour. They were stunned into silence and inactivity. Until he treated the last gem in the same cavalier manner, no one dared interrupt or condemn. They could only protest in whispers among themselves! "Who is this monkey that treats the diamond necklace so lovingly and so compassionately presented to him by Sita?" was the question on most lips. Even Vibhishana was sad that Hanuman had so brazenly insulted the priceless jewel that he had brought. 'He has pulled it to pieces and cast the gems aside', he told himself. Everyone in the Hall surmised the reason for this strange behaviour in his own way. At last, one vassal Ruler could not restrain himself. He rose and gave vent to his resentment: "Peerless Hero! Why did you break that necklace of gems into so many bits? Was it right to do so? Tell us the reason why? Give us some explanation and remove our doubts." Hanuman listened to him patiently and replied. "0 King! I examined each gem in order to discover whether each had in it the sacred Name of Rama. I could not find it in any gem. Without that Name of Rama, they are but stones and pebbles. So, I cast them on the ground." The ruler was not silenced by this. He asked, "Hanuman! If it is your desire that in every article and particle there should be the name of Rama, are you not asking for something impossible?" Hanuman replied, "Of what good, of what profit, is any thing which has not in it the name of Rama? I have no need of such". The valiant hero, Hanuman, dismissed the arguments of the ruler thus. The ruler, however, continued his objections. He said, "You would not wear any thing that has not got in it the name of Rama. Well. You are wearing your body. You are carrying it about with you. Prove to us that you have the name in it". Hanuman laughed aloud; he said, "I shall prove, see!" He pulled a single hair from off his forearm and held it very near the ear of the Ruler. He could hear the name, Rama, Rama, Rama, uttered by that single hair! At this, he was overcome with a sense of wonder; he fell at the feet of Hanuman and prayed for pardon. Rama called Hanuman near Himself and warmly embraced him. He asked him, "Hanuman! What can I offer you on this occasion? I have no gift worthy to be given to you. I am giving you myself as my gift to you." Then, he offered his body to be clasped by Hanuman's hands. The assembly was moved into shouts of Jai at this unique act of grace. They praised Hanuman and declared that there was no one to equal him in all the worlds. They praised the devotion and dedication of Hanuman. Then, Rama rose from the throne and moved out into the open, where vast congregations were awaiting his appearance. He gave them the Divine Darsan of His charming majestic Form. They were all thrilled as never before in the bliss the Darsan conferred. All who were in the City were provided festive reception and given lavish food and luxurious shelter. Rama arranged for the distribution, as charity, of gold and money, of vehicles, household utensils and clothing, of houses and other amenities in plenty. Vibhishana and the Vanara heroes were wonder-struck at the magnificent elaborateness of these events. They stayed on for six months in the Capital, serving Rama both day and night, in full exultation. The six months sped away as a single day for them. They had no memory of their homes, their families or their kingdoms during all that period of time. At last, Rama called all the companions and comrades, who had accompanied him, into the Audience Hall and seated them in appropriate places. Then, he addressed them in soft, sweet accents, thus; "Friends! You have all toiled hard on My behalf. Of course, it is not proper to praise you to your face. You confronted various difficulties for My sake, giving up your homes, not worrying about your wives and children and unconcerned about your properties and possessions. I have no friends other than you all. Therefore, I have special love and compassion towards you. More than My parents, more than My brothers, more than My kingdom, more than My subjects, and more than even My Sita, you are My loved ones. This is My firm assertion. So, I now require you to proceed to your homes. Serve Me after installing Me in your hearts, with faith and devotion. I shall grant you the fortune of seeing Me, beside you, behind you, before you and in your homes. I shall grant you Grace". They listened to these words so full of Grace and Love, and they were so overcome by gratefulness and joy that they forgot themselves and their surroundings. They did not allow their eyes to stray away from the face of Rama; they shed tears of delight abounding. They could not utter a single word in reply; the tongue was unable to pronounce any. Then, under orders from Rama, the servitors brought large quantities of clothing and jewels. Lakshmana, Bharatha and Satrughna were requested to offer them to the members of the party and to personally help them in wearing them. The Vanaras and Vibhishana were then assisted by them in putting them on and they shone with added charm and brightness. But, the Vanaras were unaffected by what was done; they stood unmoved and stiff, looking only at the feet of Rama, their adored Lord. All bowed their heads and fell at those lovely feet. And, Rama lifted them gently and embraced them with great affection. Rama told the departing groups of Vanaras and others, "Children and friends! I am awarding you the Sarupya stage of liberation, by which you are endowed with powers and attainments approximating to My own. Go back and carry out the duties devolving upon you with success and fulfill the responsibilities with which you are involved. Rule over the lands and peoples entrusted to your care and enjoy peace and prosperity". Rama provided them valuable counsel of various kinds and gave them leave to depart. Bharatha and Satrughna were struck with admiration by the devotion that shone in the hearts of the Vanaras and others. As Rama commanded, Lakshmana, Bharatha and Satrughna accompanied the party for some distance until they reached the outskirts of the City. Even as they sat in the chariots provided for them, the Vanaras turned back wistfully and shed tears at the thought of leaving Rama. The brothers saw the anguish in their faces and could not bear the sight. They knew the meaning of those streams of tears and those sad looks and praised the spirit of dedication which filled their hearts. They gave them company until the river bank and they supervised arrangements for ferrying them across. Then, the brothers returned to Ayodhya. Hanuman also returned with them. He prayed and pleaded with Sugriva, his ruler, and promised to return after about ten days for, as he said, "I cannot bear the pang of separation". Though Sugriva was not very happy, and in spite of his protests, Hanuman came back along with Lakshmana and others to where Rama was. One day, Rama proceeded to a garden with his brothers and his dear Hanuman, in order to spend some time strolling through it. The place was replete with flowers and fruits. Rama sat on an elevated seat, with the brothers on his side. The brothers were found hesitating to ask some questions, though they had the desire within them. They looked at Hanuman and communicated their feelings to him. They knew that if Hanuman put those questions, Rama would fain give the answers. The omnipresent Rama recognized the situation. "Hanuman! What is it you seek to know? Ask", he said. Hanuman replied, "O Protector of the Weak! Bharatha wanted to ask you a question. But he was stricken by doubt; he is downcast with a sense of fear". He folded his palms and fell at the feet of Rama, for having answered his query so bluntly, and in thankfulness that he was commanded to speak in the presence. Rama then spoke thus: "Hanuman! You know full well My nature. There is no difference between Me and Bharatha, nothing to make either feel distinct". When Bharatha heard these words, he fell at the feet of Rama, and said, "O Healer of the miseries of those who surrender to you! Listen. Pardon my errors and protect me. I have no doubts lurking in my mind. I have no griefs and no attachments, even in my dreams. Of course, I owe all this to Your grace and compassion. You are the treasure-house of all the virtues. I desire to learn the distinction between good men and bad." "I shall tell you the characteristics of good men. Listen. They are not fascinated by sensual pleasures. They possess all the best virtues and modes of behaviour. They will be happy at the happiness of others; they will be sad when others are sad. They look upon all with equal affection. They have no enemies and they are not bothered even if foes exist. 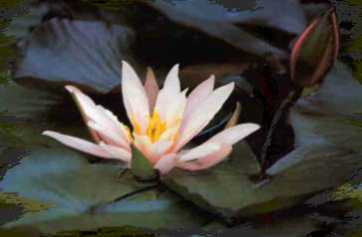 They are endowed with wisdom, knowledge of the objective world, and a deep sense of detachment. Their hearts are tender; they have compassion towards the weak and the helpless. They adore My feet with purity of thought, word and deed. They delight in serving me. They have no concern with fame or infamy, honour or dishonour. They are always interested in serving others; they never yield to the urge of selfishness, even in dreams. Their actions are transparently simple; their hearts are ever cool and unruffled. They yearn for opportunities to renounce; they are every moment soaked in joy. For them praise and blame are the same. Brother! Whoever has these characteristics in him, take it that he is of My own nature. He is myself, I am himself. Take that to be the truth". "Now, I shall tell you of the qualities of bad men. Listen. You should avoid their company, by all means. Grief will descend upon you as a result of that companionship. Their hearts will be pained at the prosperity of others. They will delight as much in scandalizing others, as in welcoming a fortune. The six foes of bad men - lust, anger, greed, desire, pride and hatred are fostered by them and they are ever at their beck and call. They move about and act according to the commands of these six. Pity and charity are absent in their makeup. They pick up quarrels with others with no reason or on no provocation. They develop enmity even towards those who do good to them. Their actions are false; their utterances are false; their dealings of give and take are false. Their attitudes are hard; they have hearts of stone. The peacock is charming to behold; its cry is pleasant to hear; but it kills snakes. So too wicked men are eager to harm others, and craving for others' wives. They relish damaging the reputation of others. They revel in evil; they are evil-minded all the time. They are the meanest among men. They have no fear of retribution. When they see or hear about the progress of another, they are possessed by so much envy that they are afflicted with unbearable headache. But when others are caught in calamity, they exult over their sufferings, When others are suffering, they are elated as if they have been crowned kings of the realm. They are dominated by the ego; they do not have any thought of helping others, even in their dreams! Their hearts are the birth-places of lust, anger and other passions. They have no consideration towards parents, preceptors or elders. They feel disgust at the very mention of 'good personages' or 'God'. Their intellects are dull; their conduct is reprehensible. They can be observed in large numbers during the Kali Yuga. (*) Bhagavad Gîtâ of Order, Ch. 16, 17 and 18. The Bhagavad Gîtâ of Order in Real Audio, spoken by Anand Aadhar Prabhu.